Graduated in agricultural science in 1984, he defines himself as an agronomist before as a winemaker. During the first years of study at the Faculty of Agriculture at the University of Florence, he is attracted by the various disciplines of the world of agriculture. Then comes the shock for viticulture and for oenology immediately after. He personalizes its curriculum with the subjects more suitable for knowing the vine and the world of wine. He graduated with 110 with honors. Employed by Ruffino, where he will remain for seven years, the first in the establishment of Pontassieve and the others in the country to to follow the proliferation of corporate ownership. Chioccioli himself defines these seven years as formidable years because they allow him to unravel the complex issues surrounding viticultural and winemaking that will prove crucial in his professional experience. In 1992 Stefano Chioccioli starts to take its first steps alone, as a consultant for cultivation and wine. Since then, the escalation is unstoppable: new consultings and new successes that lead to the fore, even international, very new wine brands or old brands to be re-evaluated. Here comes the 1995, an important year, not only for the arrival of her daughter Ginevra, but also for the launch of new consultings, also for Livio Felluga, which still represents for our wine maker the pillars of vine and wine with whom we constantly compare. The wines he signed during his consulting activities have won many awards such as: over 100 wines with three glasses on Gambero Rosso guide, many 92, 93, 94, 95, 96, 97, 98 points in magazines Wine Spectator, Wine Enthusiast, Wine Advocat, up to the 100/100 is awarded by Robert Parker Wine Spectator. 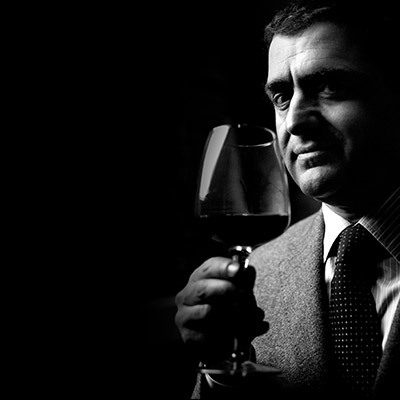 He is a member of numerous organizations dedicated to viticulture and oenology and various committees of taste. In recent years, lends his consulting activities for the family company, where he worked at their side, especially with his son Niccolò, in the production of wines of excellence with the brand Chioccioli Altadonna.